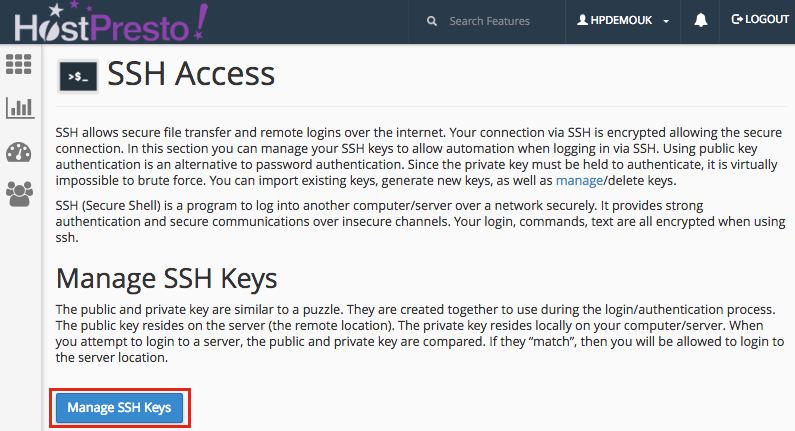 Your can create a SSH key to connect to your hosting account using the cPanel control panel. This key will serve a purpose of being an authorised remote connection to your account. 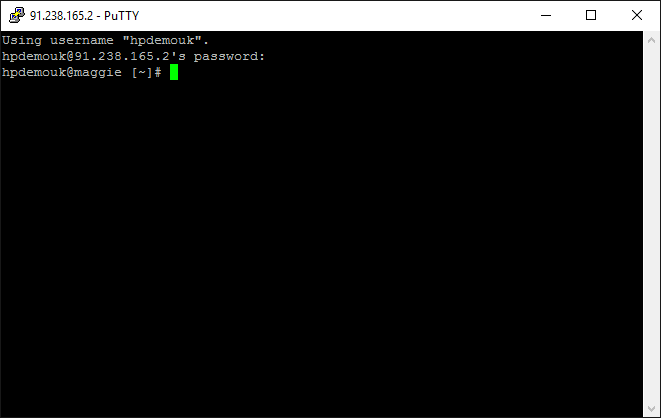 This article explains how you can create a SSH key and then use this either on Windows 10 or Mac OS X to connect to your hosting account. Scroll down to the 'Security' section and choose 'SSH Access'. Generate the new SSH key by choosing 'Generate a New Key'. Type in a password for your SSH key into the 'Key Password' and 'Reenter Password' sections. You can also make use the of the 'Password Generator' if desired. Once the password has been entered, choose 'Generate Key'. The key generation is now complete. Choose 'Go Back' to continue the process. Under the 'Public Keys' section, we can now see our new key. However, at the moment the 'Authorization Status' is set to 'not authorized' which we need to change. We do this by selecting the 'Manage' option. Authorise the key by selecting the 'Authorize' option. The process will now confirm that the key is authorised. Select 'Go Back' to continue the process. We now need to download the private key to the local system (the machine that you will connect to your account from). To do this, in the 'Private Keys section, choose the 'View/Download' option. Convert the key to PPK format by firstly typing in the password that you set earlier for your SSH key. Once entered, select 'Convert'. This will then start a download on your system which is your private key. 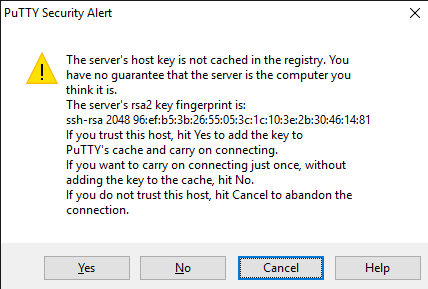 This key will need to be configured on your SSH application in order to successfully authenticate. If you are using Windows, put the downloaded 'id_rsa.ppk' SSH key file in a secure folder on your system. 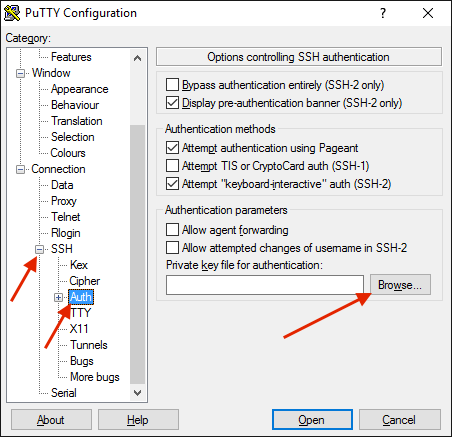 This section explains how to SSH with a SSH key using PuTTY. 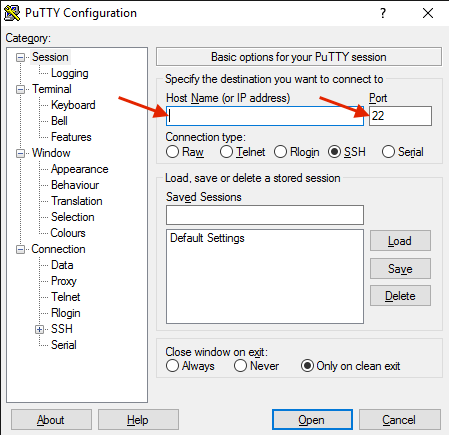 If you do not already have PuTTY installed, please see 'Using SSH / SFTP'. Next down the left hand side, choose 'SSH' followed by 'Auth'. 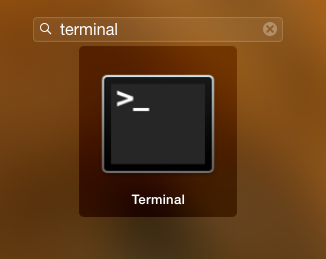 Under 'Authentication parameters', select the 'Browse' and then locate where on your system your SSH key is. Once found, double click it to return back to PuTTY. On the left hand side, return back to the 'Session' section where you were before. Select 'Open' at the bottom. The SSH connection should now be established. You have now successfully connected to your hosting account using your SSH key. Using Mac OS X, you will need to put the downloaded 'id_rsa.ppk' SSH key file in '/.ssh/authorized_keys/'. If you've not yet moved your SSH key to the right folder on your system, you can do this by typing these commands with the respective replacement. Using sudo, you may be asked for your system password. This may again ask for the system password. However, it will ask the SSH key password that you set earlier. When entered, the SSH key will be loaded. You should now be successfully connected to your hosting account via SSH on Mac OS X using your SSH key.